The main difference between fibrous and globular protein is that the fibrous proteins are made up of long, narrow strands whereas the globular proteins have a compact, round shape. Furthermore, the fibrous proteins have a structural function in the body while the globular proteins have a functional role. Fibrous and globular are two types of proteins in the body. Both of them are important in the functioning of the body. A fibrous protein is an insoluble protein with a fiber-like structure. Another name for fibrous proteins is scleroproteins. Some examples of fibrous proteins are collagen, elastin, actin, myosin, keratin, etc. 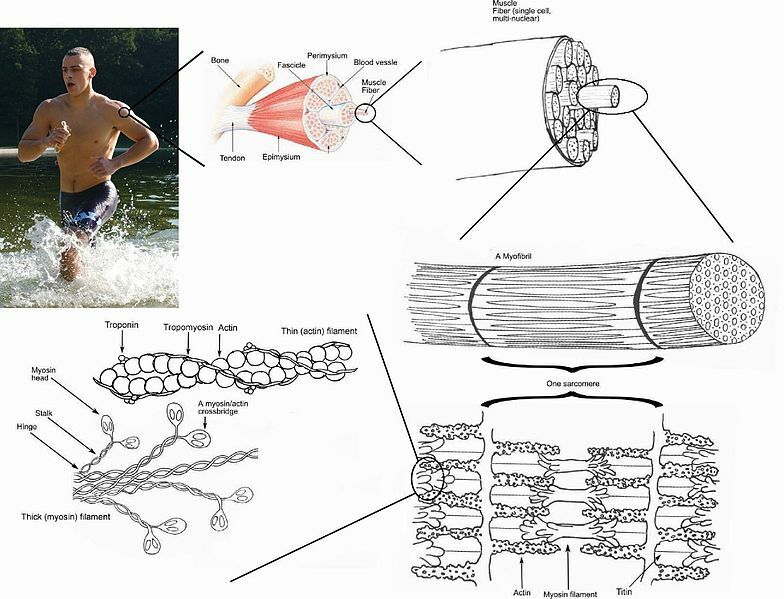 The main function of fibrous proteins is to form structural frameworks of the body such as connective tissue, cartilage, ligaments, blood vessels, lungs, uterus, hair, and nails. Hence, these proteins provide structural and mechanical support to the body. Other structures formed by fibrous proteins are silk and sponging. A globular protein is a soluble protein with a spherical structure. Hence, this protein is in its tertiary structure. Due to the solubility, globular proteins can be transported into different parts of the body through body fluids. Their solubility is due to the weak intermolecular interactions. Globular proteins have a vital role in the body since they are involved in various metabolic functions. Some globular proteins, such as enzymes, catalyze biochemical reactions; hormones regulate the functions of the body, maintaining homeostasis. Hemoglobin-like globular proteins transport oxygen. Albumin and globulin are the two main types of globular proteins in the blood. Fibrous and globular protein are two types of proteins found in the body. They are in the tertiary structure of proteins. Both perform a vital function in the body. A fibrous protein refers to a class of insoluble proteins which constitute the main structural elements of the body while a globular protein refers to a protein soluble in water and tend to be involved in metabolic functions. A fibrous protein has a long, narrow shape while a globular protein has a round or spherical shape. The structure of each protein is one main difference between fibrous and globular protein. Fibrous proteins have a helical or sheet structure while globular proteins have a folded ball-like structure. Furthermore, fibrous proteins are in the secondary structure while globular proteins are in the tertiary structure. Furthermore, a fibrous protein consists of a repetitive amino acid sequence while a globular protein consists of an irregular amino acid sequence. Also, the fibrous proteins have strong intermolecular interactions while the globular proteins have weaker intermolecular interactions. Fibrous proteins are insoluble in water while globular proteins are soluble in water. 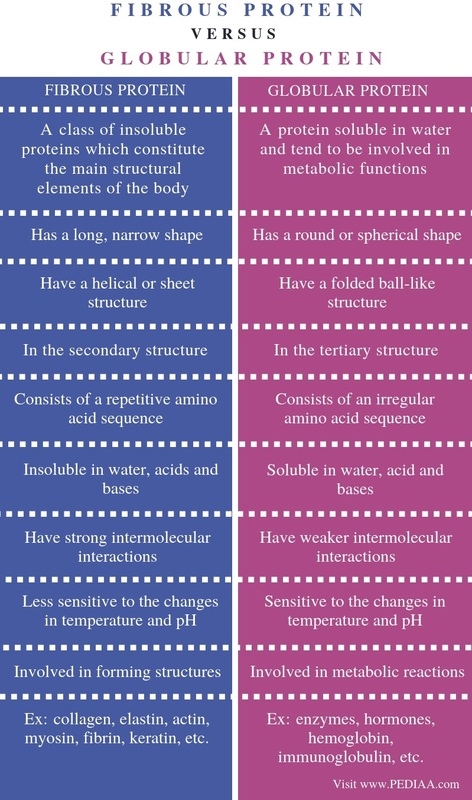 Moreover, fibrous proteins are insoluble in acids and bases while globular proteins are soluble in acids and bases. This is also an important difference between fibrous and globular protein. Moreover, the fibrous proteins are less sensitive to the changes in temperature and pH while globular proteins are sensitive to the changes in temperature and pH. Fibrous proteins are involved in forming structures while globular proteins are involved in metabolic reactions. This is yet another main difference between fibrous and globular protein. Some examples of fibrous proteins are collagen, elastin, actin, myosin, fibrin, keratin, etc. while some examples of globular proteins are enzymes, hormones, hemoglobin, immunoglobulin, etc. Fibrous protein is a fiber-like protein with a helical or sheet structure. It mainly involves the formation of structures. On the other hand, globular protein is a spherical protein with a tertiary structure. It mainly involves in metabolic functions of the body. Therefore, the main difference between fibrous and globular protein is their structure and function.